Being parents for some time we have acquired numerous toys and games. We found that the best toys are those that appeal to both boys and girls. We also discovered that quite often some of the greatest toys are not in the spotlight. This is why we want to share here the wonderful toys and games that we found by accident and that others may not know about. We hope that our reviews will help parents select the best gifts for their children (and for themselves). Our selection of building toys includes some not well know ones, as well as classics, such as marble run, tinker toys, and building blocks. We feel that when a classic toy is made by too many manufacturers people are facing dilemmas and confusion as to which one to choose. We did a lot of reading and recommend the best for each of the classic toys listed below. Although the manufacturer suggested age is 8 – 15 this set is just the right size and complexity for kids ages 6 – 10. The instructions are easy to follow and not much reading is required. All you need is to follow the diagram and snap the corresponding elements in place. Don’t expect your child to learn circuit basics from just snapping the parts, though. Someone has to actively teach and explain the workings of the setup to them. But whether or not they understand how it works, it is still great fun for younger kids to just follow the instructions and make the lights flash, the police siren go off, or the spinner fly in the air. This set comes with 30 snap parts which are enough for more than 100 projects. The larger snap circuits have the same size circuit board but many more parts and a number of project booklets. We think that the larger ones will be good for older kids if they never had the snap circuits experience before. 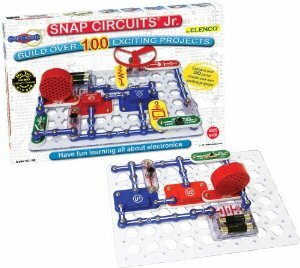 Our 8 year old son enjoyed the Jr. set for years before we decided to move on to the Snap Circuits Extreme SC-750. This was a mistake. He played a bit with it but nothing like we expected based on his interest in the Jr. version. The too many parts and projects were overwhelming. The more is not always better. 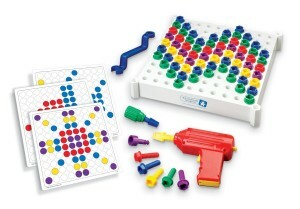 The Design and Drill Activity Center is ideal for small children from 3 to 6. They just love to use tools and this drill gives them the opportunity to do so. When our son was two he got a little toolbox with a drill that made noise but didn’t do anything. He really wanted it do be able to do something because he had seen a real drill. For his fourth birthday we bought the Design and Drill set and he was finally happily drilling. The drill is very safe and stops turning when the bolt is completely screwed. The drill bits are easy to change and just snap into place. There are 20 activity cards for making colorful designs with the bolts but many children just don’t bother to use them. It is so much fun to just drill! There is a smaller portable version, the Design and Drill Take-Along Kit, where the board also doubles as carrying case. There are many variations of this engaging toy. Some use wooden pieces while others utilize interlocking tubes made of plastic. We think that the wooden ones are not appropriate for young children because they require precise positioning and balancing of the blocks. Even older children need a lot of patience to make those structures work. 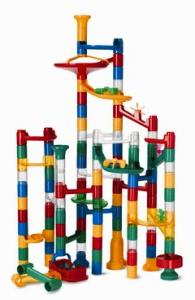 Out of the plastic sets two are very similar and of good quality: Marble Run by MindWare and Build & Play Marble Run by Constructive Playthings. Their pieces even fit together. They are sturdy and easy to build in many ways. The pieces are large, stack and click together. There are colorful chutes, tubes, drop-throughs, merry-go-rounds and spinners. The differences between the two sets are minor. The marbles in MindWare are glass ones while those in Constructive Playthings are plastic. Both sets work with regular glass marbles. The MindWare set has more pieces and also has a few transparent ones for extra fun. Each of the sets can be expanded by adding accessories: MindWare Add-on and Constructive Playthings Accessory Set. The sets can also be purchased with their corresponding accessories in one box: MindWare Marble Run with Add-On and Build & Play Marble Run Plus Accessory Set. 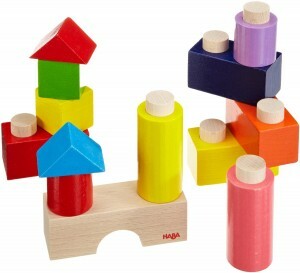 The wooden building blocks are something that every child should have. There are many sets and the better ones tend to be pricier. Some are colored while others are just plain wood. The best ones are smooth and made of solid wood. Melissa & Doug make some of the best wooden basic blocks out there. The 60 – piece set pictured here features a large variety of shapes and sizes including arches, columns, squares, rectangles, triangles, cylinders, and circles, as well as basic, half, and double unit blocks. The pieces are made of rubber wood which is quite resilient. They are large and suitable for children 3 and older. 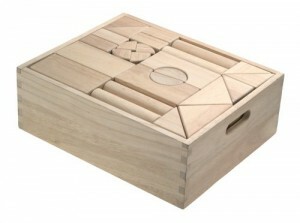 The blocks come in a wooden storage box. The whole set with the box is quite heavy (about 19 pounds). 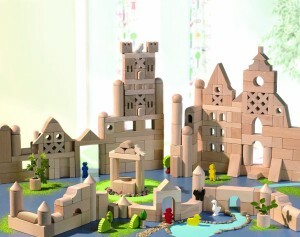 Haba also offers many wooden block sets that are quite specific for making particular structures, such as the Coliseum, pyramid or a russian house. In our opinion they are more suitable for teenager and adult hobbyists because most children will just build whatever they like and will not follow the instructions. There are many adorable Haba color blocks but those should not be given to children that wound put them in their mouths. Some of them are even “sticky” and attach to each other. Another company making high quality solid wooden blocks is GuideCraft. GuideCraft blocks used to be made out of maple but now are made of rubber wood. They are marketed as blocks for pre-school and kindergarten classrooms but obviously can be used at home as well. The unit blocks come in 34, 76, and 110 piece sets. GuideCraft also makes non-traditional blocks with mylar mirrors or colored plexiglass embedded in a wooden frame. The gears by Learning Resources provide unique learning opportunity for kids from 3 to 10 years. The 150-piece set pictured here features plastic gears, connectors and interlocking bases in a giant storage tub. Kids can build form their imagination or follow the instructions in the activity guide. Basic gear sets such as this one provide endless opportunities for building various structures. When choosing a set keep in mind that some are limited in the ways the structure can be build unless they are added to a main set. There are also gears with magnetic backing that can be used on refrigerators and magnetic boards. 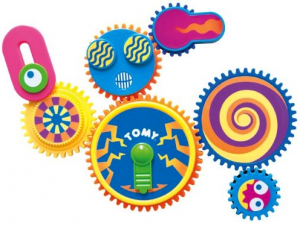 Pictured here is a refrigerator battery-operated set of 5 interlocking gears by TOMY. The on/off button switch is on the main gear. When the gears turn they create mesmerizing effects. A similar set by TOMY (not battery-operated) comes with its own magnetic board and 11 gears. You can find a few other magnetic gears on Amazon as well. Magformers is a great building system with educational value. It is similar to Magna Tiles but only better. In addition to building free-style, kids also learn how to build 3D geometric shapes. This set provides 62 multi-colored pieces: 20 triangles, 30 squares and 12 pentagons. Each piece is made of durable plastic and has strong neodymium magnets on the sides. The pieces stick together very well. You can see in the video how easy is to create great looking shapes. 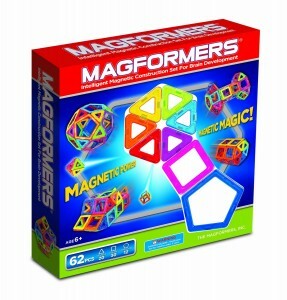 Magformers is for kids 6 and older but obviously even younger kids can stick the pieces together to create fun shapes. If your child falls in love with Magformers be prepared to add more sets for truly amazing designs. Some sets, such as Magformers Cruisers include wheels for making cars. And Magformers RC Cruisers takes it to the next level with remote control. 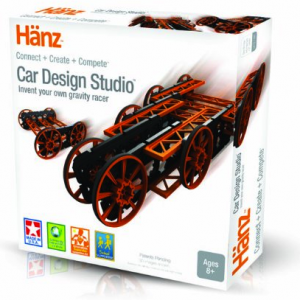 Hanz Innovations is not a typical building system. It uses only 3 types of connectors: brains, beams, and wheels. The brains are the black parts which provide slots for connecting the orange beams and the wheels. The brains, beams, and wheels also come in one size which makes building as easy as building with wooden blocks. There is no need to endlessly search for parts as in other building systems. Hanz toys are manufactured in USA from recycled plastic. The Innovations system is very new to the market but with tremendous potential. We expect to see many more kids design their own creations in the coming years. It really encourages free-style building and innovation. The set pictured here contains 8 wheels, 40 beams and 20 brains. The wheels are 2″ in diameter, free spinning and don’t require an axle. Hanz offers a number of other sets as well. Engino is a building system very popular in Europe. It is different than Lego Technic and is also cheaper when similar sets are compared. The system is comprised of multi-faceted rods and connectors that allow connectivity on up to 6 sides simultaneously. The set pictured here is a good starter set for beginners. With 104 parts kids can make 18 different models ranging from cars and planes, to windmills and cranes. It also includes a 3V motor that allows to animate the creations. The manufacturer recommended age is 5 to 15 years but very young kids may have trouble connecting and disconnecting the pieces due to the force required to do so. Engino sets can be combined to create bigger builds. Couple of years ago we bought a very expensive set for building machines from Lego Education. Have we known about Thames and Kosmos we would have surely preferred their system. It is very similar to Lego Education but way much more affordable. Although the pieces in both systems look almost identical, they are not compatible. 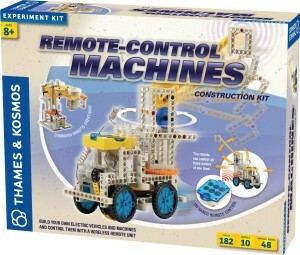 Remote Control Machines set is the perfect set for building motorized vehicles and machines and controlling them with a remote. It includes 182 pieces, 3 motors, instruction booklet, battery holder and an infrared remote control. The remote has 6 buttons which allow to control the three motors simultaneously, moving each of them forward or in reverse. The three motors can be combined to make complex vehicles and machines in numerous configurations. Total 10 models can be build with this set including a bulldozer, various cars, a crane, and a robotic arm. Thames and Kosmos also make a number of wonderful science kits, such as Physics Workshop, Motors and Generators, Wind Power 2.0, and many more. 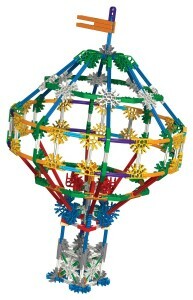 K’NEX is a very good building system utilizing flexible parts that are easy to put together. The system encourages free-style construction as well as building elaborate structures from the instruction booklet. It is made in the USA and comes in three sizes. 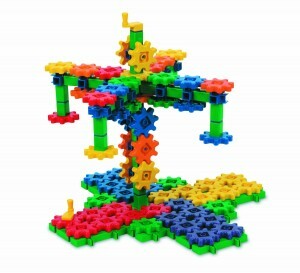 K’NEX Kid sets have large pieces suitable for children 3 and over. 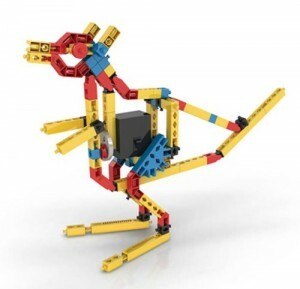 K’NEX Classics sets have the standard size pieces and are recommended for children 7 and older. And finally, K’NEX Micro sets use very small pieces but are also for kids 7 and older. When choosing a set read the reviews carefully because some large sets, such as this K’NEX 521 Piece Value Tub contain both Classics and Micro pieces. The set shown here is the K’NEX Classics 50 Model Building Set with 700 standard pieces. Kids can build 50 models including a sand castle, hot air baloon, sea creatures, trucks and more. It is the best set with standard size pieces. This classic toy comes in a few variations not always bearing the name TinkerToys. There are still wooden versions (Makit Toy and Fiddlestix) like the original but they are not of very high quality. There are also two plastic versions, Superstructs and Tinkertoy. 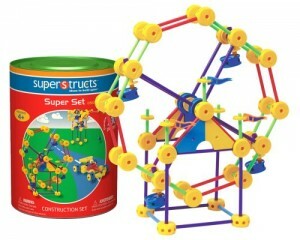 Superstructs is the closest to the original as far as the pieces go. A few sets with varying amount of pieces are offered. The best set to get is the Superstructs Super Set. It has the most pieces (230) and the amount is not overwhelming but just right for free play. The set comes with 59-page instruction booklet for making elaborate structures, such as a working Ferris wheel, large crane with movable beam, working Merry-go-round, and cars and trucks. We bought our set 6 years ago and got a lot of imaginative play out of it. At 9 our son still plays with it and the pieces are the building material for anything he needs, i.e. he opens the tub not for the purpose of playing but to build something that he needs. The only problem with Superstructs is the type of plastic that they use. It just ages with time and indeed, as many people mention it, the sticks begin to break. It happened to us after the 4th year. But there are still many connectors in a good shape and we would buy the set again because it is the best of this type. 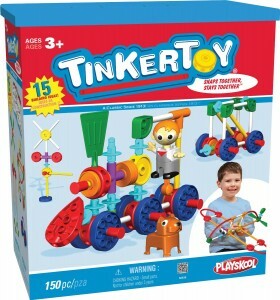 Tinkertoy is a modern variation designed and manufactured in USA by the company that makes K’NEX. This is not the traditional TinkerToys but is still a fun building system. There are number of sets with varying amount of pieces. The Tinkertoy Transit Building Set pictured here includes 150 durable, plastic pieces including spools, straight rods, bendable rods, wheels, eyes, two buildable figures and more. It comes in a durable box with lid for easy storage. The recommended age is 3+ but three year olds are likely to need help snapping the pieces together. 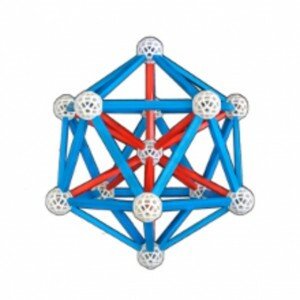 Zometool kits are used by architects, molecular scientists, chemists, and engineers to model complex structures. They are also used as a teaching tool by teachers at every level including college. The main part of the system is a spherical plastic connector node (ball) with 62 geometric holes. The nodes are connected to each other with color-coded plastic struts (sticks). The angles and strut lengths are mathematically precise and enable users to build thousands of geometric structures. Because each connector node has 62 holes, it is possible to build in 62 different directions. Zometool is completely unique in that it is easy enough for a 6-year-old to play with, while at the same time letting adult users build truly mind-boggling models. It is manufactured in USA and comes with lifetime guarantee. Any broken pieces will be replaced for free. There are 4 main Zometool kits for general purpose building (Creator 1, 2, 3, and 4), as well as smaller kits for particular projects, such as building carbon molecules, DNA, ice crystals, phage virus, and many more. For really big projects or for many users Zometool offers a couple of very large kits. They also sell the parts individually through their website. 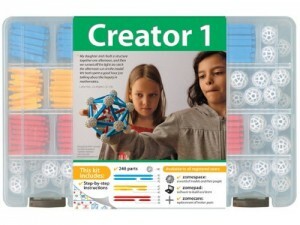 Creator 1 is the perfect beginner’s kit with 246 pieces including 60 white balls and 62 each of red, yellow, and blue struts in 3 different lengths. 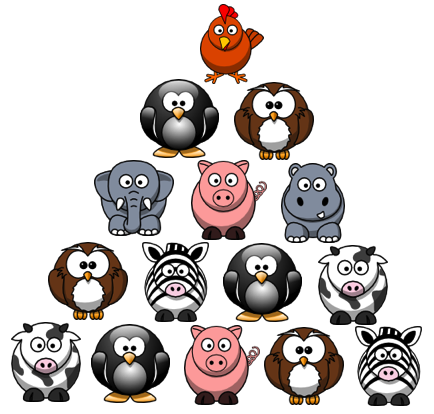 Kids and adults can build geometric structures free-style or build the models in the instruction booklet. If you like this system, a project kit with balls in color will be a great addition to this kit. We saw the Magformers in a science museum recently. My kids had a blast. It was very interesting to make something on the table and then pull it slowly up to make a 3d object.